An engagng, interactive introduction to the topic. Like other activities in the Northgate "Card Series" participants, in small groups work through a set of 30 cards designed to create discussion, provoke thoughts and ideas, and elicit some general rules about dealing with conflict. True/False Cards contain statements on aspeccts of conflict at work. Groups decide whether they are true - or false. All decisions are noted along with the group's reasoning, ready for the debrief at the end where views of all the groups are aired. Round Robin Cards provide a platform for identifying and reviewing what happened in conflict situations that members of the group have experienced in their own workplace. 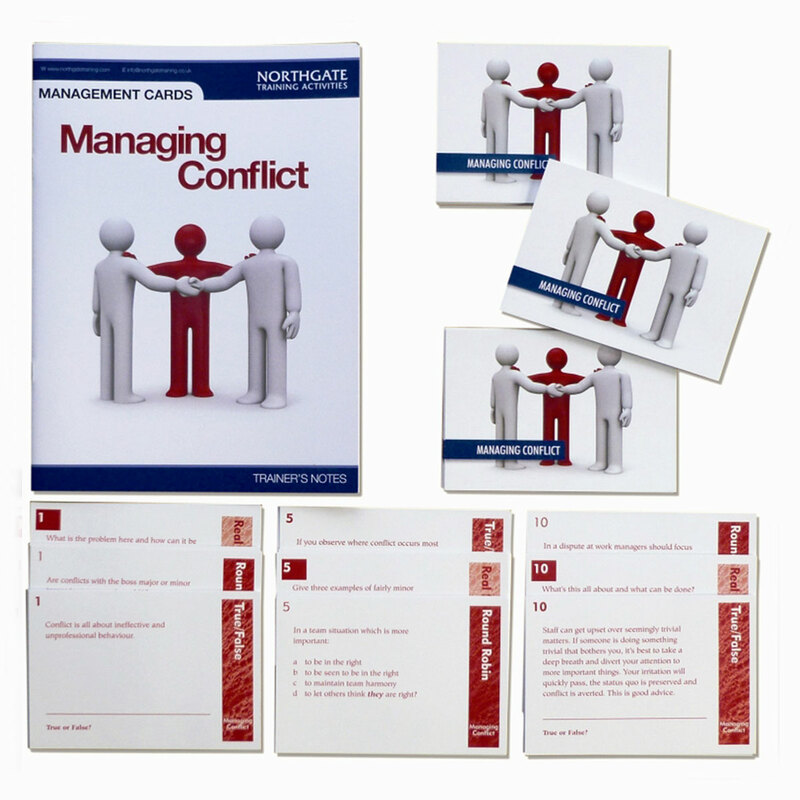 Real Situation Cards describe a range of real cases of conflict in the workplace. Groups decide how they would manage the situation if they were faced with such an issue. Once groups have worked through all 30 cards - or as many as time allows - and made relevant notes, the session moves to the Debrief. Here responses are compared and contrasted. Is there broad agreement or much variation? What points can they agree on? Can they agree a list of effective, guiding principles for use when dealing with conflict situations back at work? Notes for the Debrief are in the Trainer's Notes that comes with the pack. Give a brief introduction, divide participants into groups (3-6 per group). Issue each group with a set of cards (and paper for making notes). Lead a Debrief to review group responses to the cards. Draw up key learning points. Full notes for the Debrief are given in the Trainer's Notes. For easy reprinting, handouts are supplied as PDF files.